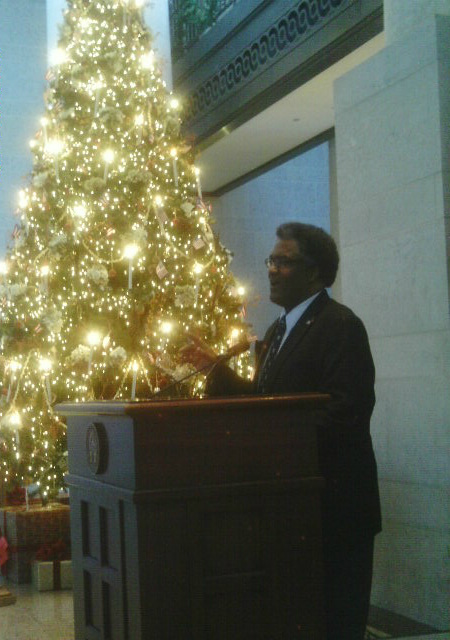 Eric LaMont Gregory at the Ohio State Capitol Rotunda. We are living in times not unlike those that existed when this great nation was created, a nation forged from the mettle of a few highly dedicated individuals. The republican experiment, a nation principled by the rule of law, is the course the founders embarked upon. The ideas with which the framers struggled concerned the relationship between a people and a peoples' government. And today, those same ideas are on trial with renewed vigour. Washington suggested that the ‘marvel of all history was the patience with which men and women submitted to burdens unnecessarily laid upon them by their government, burdens unnecessarily laid upon the citizen by their own government'. where happiness was defined as ‘the full use of one’s powers along lines of excellence.’ They understood the necessity of having an occupation, and accepted the idea that we garner much of our sense of self-worth from the work that we do. McKinley also understood this and suggested that ‘it is the interest of the working man with which the nation must be concerned. Because, when people work, people save, and when people save they invest. And, when the American people work, save and invest - America prospers’. The framers also sought to answer the basic questions of governance. What is the public good – and their answer forms the Preamble to the Constitution. ‘We the people of the United States, in order to … form, establish, insure, promote and secure the Blessings of Liberty’. States rights vs. Federal Powers – they enumerated federal powers, reserved the powers of the states, and retained the right of the people to safeguard our own liberty against encroachment by the federal government or the states. As to the limits of executive authority – they placed the requirement that the executive seek the advice and consent of our elected representatives. The economy –then as now the resounding question is how do we deal with the debts of the states. Those dedicated individuals, the framers, did not always agree, and left it to future generations, ours included, to solve some of the more perplexing problems concerning the nature of our political arrangements and our economy. individual to have the advantage of their joint wisdom. You inevitably assemble with those individuals all their prejudices, their passions, their errors of opinions, and their selfish views’. All of these attributes are involved and reflect the nature of the contemporary political stage; where one party passes a key piece of legislation; only to have the party opposite challenge it at the polls. What is good and healthy, however, about our current political discourse, is that we, as were the framers, are laboring for the future of this great republic. We are re-visiting the essential nature of governance. The basic question is - what shall we, this generation on whose shoulders the mantle of authority now rests, make of our future? I do not believe that we will allow the forces of division to prevail, but that we will stand tall, by standing together. I believe that we will live up to the full meaning of our creed; one nation, under God, indivisible, with liberty and justice for all. And, when the inevitable foe challenges us, we will stand united and always show up for a showdown. It is our responsibility, and our opportunity, to conquer the blights on the human condition; hunger, ignorance,and disease. It will be of little consequence however, if we foul the air, water and soil that provides the basis of our existence. Join with me in the task of not allowing government to interfere with citizen enterprise. And at the same time, to encourage every American to use their God-given liberties to create opportunities for meaningful work, and thereby, use their full powers to pursue lives of excellence. These are the challenges of our age, and the history of our time will record how well we meet these tasks, how well we fulfill the destiny of our American Republic. God, and solemnly swear to support, defend and bear full allegiance to the Constitution of the United States, and to faithfully discharge the duties of a United States Senator. May God bless you and best wishes for this season and the new year.